Fast & Furious 8 Movie Review : Hollywood Action Entertainer The Fast and Furious 8 movie has released today. Fast & Furious is one of the biggest sequel in the Hollywood.The eighth movie in Fast and Furious 8 is missing one of the lead actors Paul walker who had expired in the between the F7 due to a car crash. The F8 script has been changed and modified by removing the character of Paul.we are bringing you the Fast and Furious 8 movie review along with ratings. The Fate of Furious which is also known as Fast and Furious 8 is the latest film featuring Vin Diesel as main lead. This American Action Film is directed by F.Gary Gray, and Chris Morgan is the writer. This is the eight the film of the Fast and Furious series starring Vin Diesel, Dwayne Johnson (Rock), Jason Statham, Michelle Rodiguez, Tyrese Gibson and Chris Bridges. Dominic Toretto(Vin Diesel) is a former criminal; and professional street racer who gets retired and chooses to live a simple, normal life with his wife Letty(Michelle Rodriguez) who is also a professional road racer. Dom and Letty decide to go on honeymoon to Cuba while his other crew members are trying to adjust to their normal lives unknowing that their lives are going to take a turn. When Dom and Letty were in Cuba, a mysterious woman enters Dom’s life, seduces him and tries to change him against the people he is close with. Dwayne Johnson Aka The Rock along with the villian Jason statham in the Fast and Furious 7 teams up for saving dom. The rest of the story revolves around former enemies popping up again, who the mystery woman is and what happened in the end. 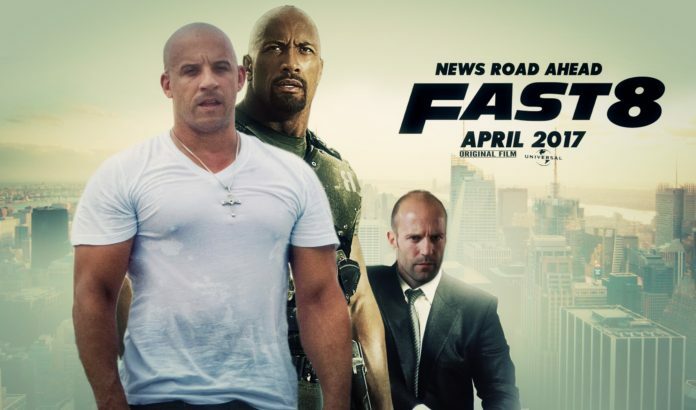 Just like every part, Vin Diesel played the role of Dominic. However, the way he was seduced by other girl and turns against his team is a little upsetting for the fans. Dwayne Johnson did an exceptionally well job as Luke Hobbs, a DSS agent. Charlize Theron plays the roles of Cipher who is a cyber-terrorist, seduces Vin and turns him against his allies and includes him in terrorism. The story of the movie is as intelligent as it can be. The film feels like 136 minutes of high octane ride. More than the story characters, the movie seems to be focussed on CGI, action scenes, music score, direction and of course cinematography. The film is highly filled with action scenes which are far from reality. Keeping the not-so-real scenes aside, the movie is pure fun and entertainment. Amid guns, explosions, and cars, the Writer told a story beyond anything. Cinematographer Stephen F.Windon made the movie even more worth watching. Editing by Christian Wagner and Paul Rubell is good. The film is released in all 2D,3D, and IMAX 3D formats. The movie Fast and Furious 8 is trending in twitter with #Fast&Furious8 and the film is receiving good response from the audience and critics all over the world. Finally, F8 is a fun and action packed ride. Though the movie isn’t better than its previous film, it is fun in its own unique way and is worth a watch.